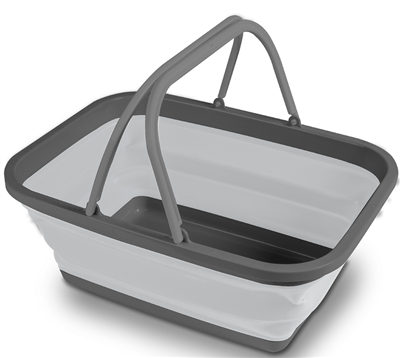 The Kampa Washing Bowl folds flat when not in use and opens and folds in seconds, and easy to wash. These handy folding wash bowls come in two sizes. This product is well made, easy to pull out and collapse, very stable when on a surface, and should last a long time. Probably much better than square designed ones. Nicer than a supermarket basket when carried, but I would not recommend carrying it with water in it as it tends to swing. Had to replace a cheaper version because it had split after only a few weeks! So far all looks good with this one, and handles are a bonus! Excellent quick service. Had to order on line as not in stock at our local outlet, which was disappointing. Haven't used it yet but it is a good size and the quality seems good for carrying dirty dishes to the washing up area on a campsite. Stays folded and then opens easily. Good size washing bowl. Easy to carry when full and holds a fair amount too. Dries quickly and easy to store. This product does what it says on the box it is fantastic.